We would all like to think that our teams are already in peak performance mode, but it takes time and effort to get a bunch of individuals functioning as an effective group. Psychologist Bruce Tuckman classifies teams into 4 types of groups: Forming groups don’t know their individual roles and display polite behavior along with anxiety and/or excitement. Storming groups have started getting down to business and are experiencing the natural friction, frustration, conflict and stress that emerges before team members become accustomed to each other’s individual working styles. Norming teams have gotten to know each other better and begun to reconcile their differences, recognize colleagues’ fortes and rely upon one another for help and constructive feedback. Performing groups have taken their team to the next level, uniting with a common purpose to achieve their goal and working without friction while recognizing the crucial niche that each individual member fills within the team. Just because you’d like your group to be at the Performing level doesn’t make it true. Honestly evaluate where your group is and focus on building the team before expecting the results. Get out of the bored room. It’s easy for even the best teams to lose their edge working in an office all day, every day. Break up the monotony by getting your people outside for some fresh air and a challenge exercise that builds confidence and cooperation amongst team members. is experience can be especially valuable for “green” teams that have yet to recognize members’ individual strengths, personalities, and communication styles. In addition to re-energizing your employees’ motivation, you may also find the outdoor experience lends itself to improved awareness, memory, and learning resulting from the great outdoors’ positive impact on brain protein production, as found by Dartmouth University. We’ve come a long way from trust falls, but the concept still holds true. If you’re going to expect anything of value from your team working together, you must invest in building trust – among the members and with you as a group leader – first. Trust is earned, of course, and a good leader will work to establish individual trust every day. Trust in a group scenario, however, takes some planning and skill to build in an efficient manner. Take the time to research the type of trust building activity that speaks to you and your organization. Once you’ve established trust within your team, it’s time to focus on respect. Brainstorming is out, discussion is in, and discussion without respect is just an argument. 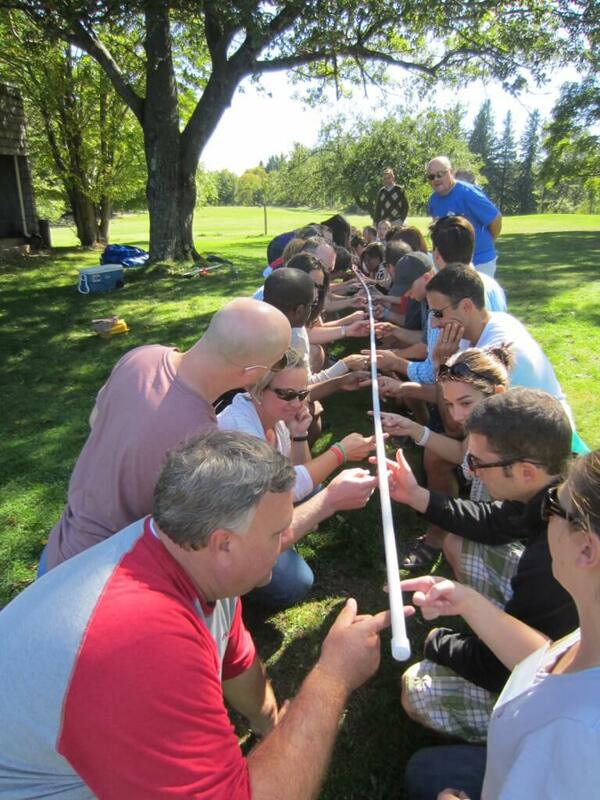 Challenge-based team building exercises are excellent for building respect in a group. These can include teams competing against each other or the whole group working together to overcome a large obstacle. Just be careful to fit the activity with your team again – if your group doesn’t respect the process because the activity is too goofy or off-base, it will backfire. Simple is usually best. One of the many values of group- working is the variety of ideas and solutions that can emerge from a group. Make sure that you are getting input from each member of the team, not just the“squeaky wheels.” Sometimes this can be very difficult, depending on the individuals on the team. Rather than calling a quiet member out, consider building in fundamental questions that are answered by every person on the team. Remember that each individual is in the room for a reason – if you can effectively demonstrate that every person’s viewpoint is worth listening to, your team will likely do the same. Cultivate an atmosphere for change. People are generally resistant to change, particularly if they haven’t been a part of creating those changes, and no group is immune. This resistance can easily develop into defensive behavior which results in closed-minded and reactive thinking – the exact opposite of what you have been working and planning so hard for. Of course, change is inevitable, so a proactive way to address a potentially negative situation is involving your team members to participate in planning the changes, not just the implementation. Imagine putting in hours and hours of team building, going through all the phases from Forming to Performing only to lose a team member to another job – or worse, a competitor. Make sure you build in regular recognition to your team building plans (and, of course, your management style). Keep a “Recognition” email folder to catalog your team’s successes and prompt yourself to seize the opportunity to broadcast an achievement when you see something that deserves acknowledgment. A thoughtful email can do wonders, and scheduling a time or activity for more formal recognition can keep motivation and loyalty high.